-and, somewhat unfairly, I’m only allotting 1 for each strip, even though in other cases I tend to allot separate counts for writing and drawing. On the other hand, he doesn’t have to fill up as many pages as most creators do. But on the third hand, coming up with a satisfying strip cartoon isn’t really easier than filling up 4-6 pages telling part of a longer adventure story. You do the bleedin’ maths, alright?! 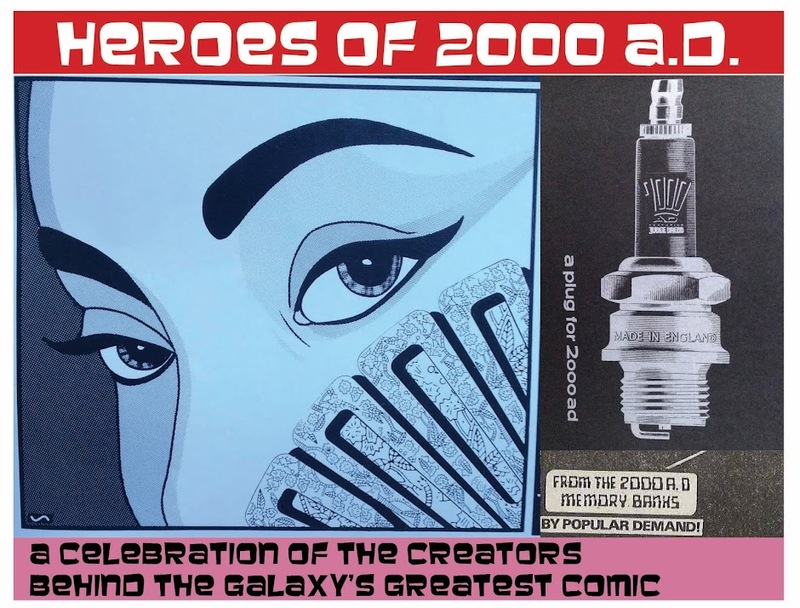 Well now, since Mr Sullivan has only ever worked on the one strip, which has a particular remit for both story and art, it seems unfair to parse out any general characteristics. But by golly does he like a good pun. Not to mention neat observations about the drudgery of office work. Not the first person to attempt to inject short gag-based strips to 2000AD*, but certainly the best, and without question the most long-lasting. It seemed so radical when Droid Life first appeared in the Prog, but has become a welcome and reliable hit of mirth, alongside the ‘damage control’ text buried in the legal bit at the bottom. 'Cross Roads'. By Wagner & Gibson. My memory of reading at the time was that this was a neat experiment, but one that would run a natural course – chiefly, a sequential run of episodes very early on (Progs 1379-1381). 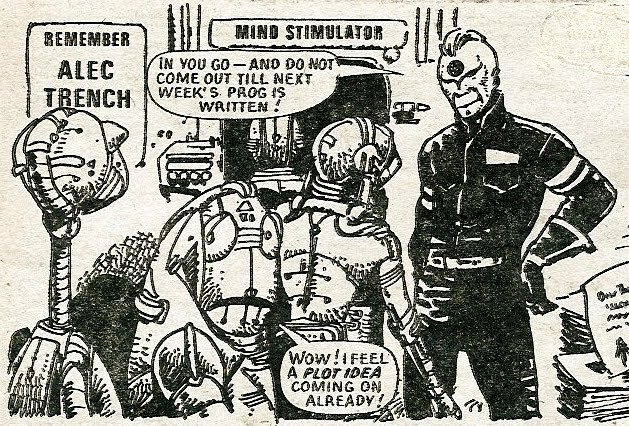 The original joke of the series is that Tharg uses Droid P14 to mark page numbers (well, just one page number) on the Prog. 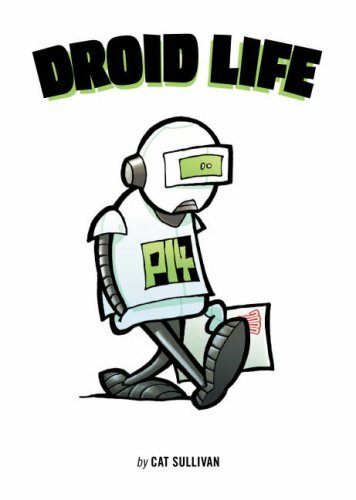 And then uses another Droid, P14’s mate Crumbs, to erase the number, so the Prog appears pristine at the end. It’s funny because this sort of 'job-to-bo-purpose' thing happens in real life, and not least where robots and programming are involved. And it works for the series because everyone loves a loser. Anyway, after discovering this nonsense for the first time, P14 and us readers were overjoyed when Tharg deigned to allow P14 a single shot of glory as that particular page number genuinely was printed into the Prog. Once. And I thought it’d all end there. But no! Gloriously, the strip has continued, roughly once every month, and has yet to outstay its welcome. 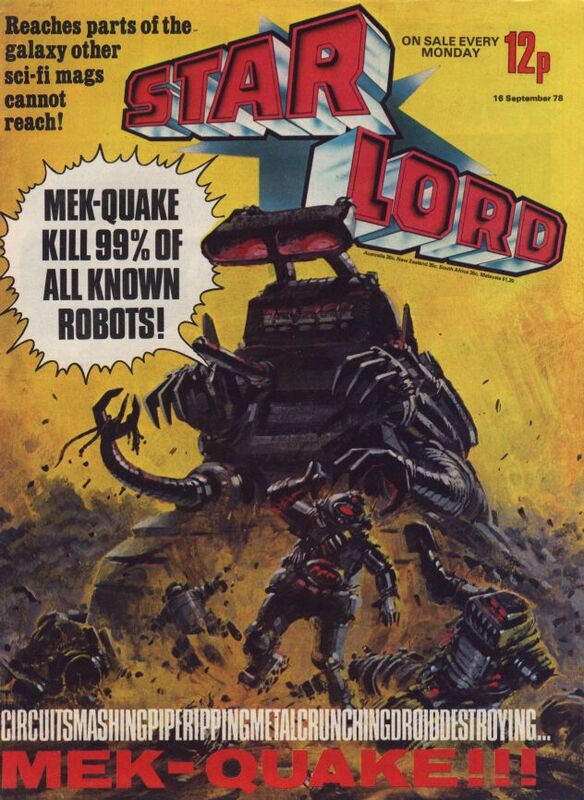 Early strips tended to focus on the inherent comedy that 2000AD has used so well of robots doing pointless human jobs. Especially on the absurdity of robots not often being fit for purpose. (the powder-keg nuclear war robot tea-trolley being a favourite) And there was a little bit of showing what it must be like to be a minion in the House of Tharg. I can't fathom it, but Sullivan never seemed to run out of jokes. Strip cartooning has got to be one of the hardest arenas in the world of comics; my hat could not be further off to him. There’s really not much left for me to do but slot in a handful of (poorly scanned) samples. This is, without question, the all-time hands down best bit of 2000AD wordplay ever. It's not all puns. There's some actual critical analysis, too. Not too many, mind, because instead of reading entire strips for free on a blog what you should do is click your mouse/touchscreen/interface of choice and buy the collection! And then tell Robokeef that you want another one! For my money, the strip has never dipped in quality, and many of the more recent ones (especially the longer strips we get in the year-end Progs) are better than ever. OK, this was meant to be a photo of my copy, but alarmingly I can't find it! One thing I don’t know – why does Cat Sullivan sign off all his cartoons as ‘R.H.’? Anyone know? -and that’s about it. I was hoping to find some sort of link about his work for Viz comic, but other than the title of the strip ‘Merry Xmas, Jesus!’ I got nothin’. *Similar ventures include Kevin O’Neill’s Bonjo from Beyond the Stars - really not good; Walter the Wobot - generally not great; Captain Klep - totally terrible; Dash Decent – a guilty pleasure of mine, but it's very specifically a parody of the Flash Gordon film from that era (I think) and has dated oddly. Sooner or Later – utterly bonkers, and not really a strip cartoon, more a story that happened to unfold in that format, sort of; Mick Austin's Things to come – always delightful; Shaky 2000's Beyond Belief – mostly inspired, and very of its time. More on some of these at the appropriate time. And I’ve probably missed a few. 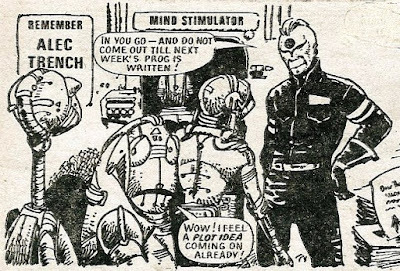 **In fact, if you’re reading this Mr Sullivan, I reckon you could get a few strips-worth of laughs out of putting the Droids onto a popular TV game show (a la Catchphrase) attempting a 2000AD-themed quiz of some sort. Maybe with Molch-R written in as the host?